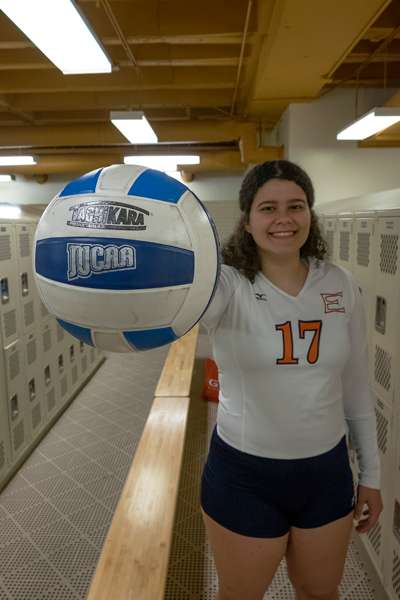 Keishla Reyes earns her title of national player of the week due to her aggressive serves and kills as an outside hitter for Eastfield’s volleyball team. Photo by Jesus Ayala/The Et Cetera. As she approaches the baseline, volleyball in hand, Keishla “Kiki” Reyes takes a deep breath and relaxes. She gives the ball a few bounces then steps forward, throwing it high into the air. She jumps, eyes never straying from the ball, and swings her right arm, striking the ball cleanly with a loud, deep thud into the opposing court to start the rally. Setter Kalli Caddell, Reyes’ roommate, said that the entire team knows to expect the power Reyes provides in her jump serves. Reyes leads the nation with 58 service aces, averaging 1.04 aces per set and is ranked fifth in the nation with 172 kills. Reyes was named Division III National Player of the Week by the National Junior College Athletic Association due to her powerful serving and offensive contributions during matches Aug. 21-Sep. 3. In that time, Reyes had 34 service aces and 78 kills. Her dominance has earned her the Metro Athletic Conference Player of the Week for Sept. 3-9, recording 75 digs, 65 kills and eight service aces in that time. Reyes, a native of San Juan, Puerto Rico, said that after she learned her preferred serving method, it has become natural and she doesn’t really think about it. “I’ve had that strength since I started, which was like when I was 5,” she said. Reyes said she constantly practices her jump serves, trying to perfect her technique as well as challenge her teammates. Reyes goes for the kill while playing against Dallas Christin College Sept. 11. Photo by Jesus Ayala/The Et Cetera. “Every practice, we do drills specifically for the people that jump serve to practice our serving for spots,” she said. “Sometimes we practice 6-on-6, so I really have to put in a hard serve. Munoz said she loves it when Reyes serves, giving both liberos a challenge and prepares them for teams with similar serves. Tomlin said Reyes’ serves are consistently powerful with a unique diagonal spin. “When she doesn’t hit it hard, you’re like, ‘What’s wrong?’ because you’re not used to her not hitting it hard,” Tomlin said. 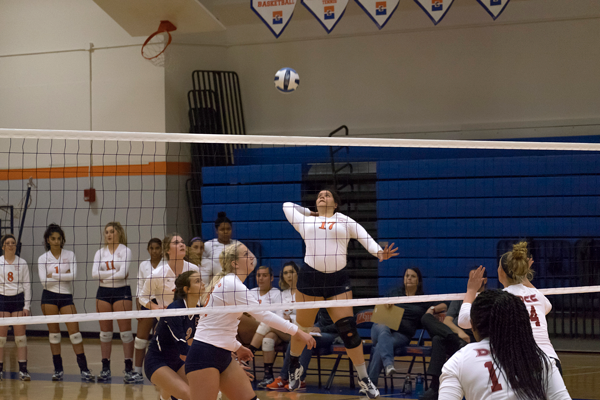 Volleyball coach Brandon Crisp said Reyes’ strong serving ability was especially evident against Southwestern Christian College on Sept. 1. In that match, Reyes had 13 service aces and the team earned 10 straight points on her serves as Eastfield swept at home. Reyes also leads the team in kills, playing as a left outside hitter. Standing at 5 feet 8 inches tall, she said it’s important to play to her strengths while playing at the net. “Considering I’m one of the smallest hitters on the team, I have to be smart about what I do and where I put the ball,” she said. Crisp says she’s the strongest hitter on the team and provides good offense playing on the left. As for her squad number, 17, Reyes said she’s felt close to it for a while now. “It was my high school number, and it was my graduation [year],” she said. The Harvesters record stands at 10-7. They look to start conference play on a strong note when they travel to Mountain View College on Sept. 18, after press time. Crisp said the keys to success this season are to stay focused on their goals and be responsible on and off the court.